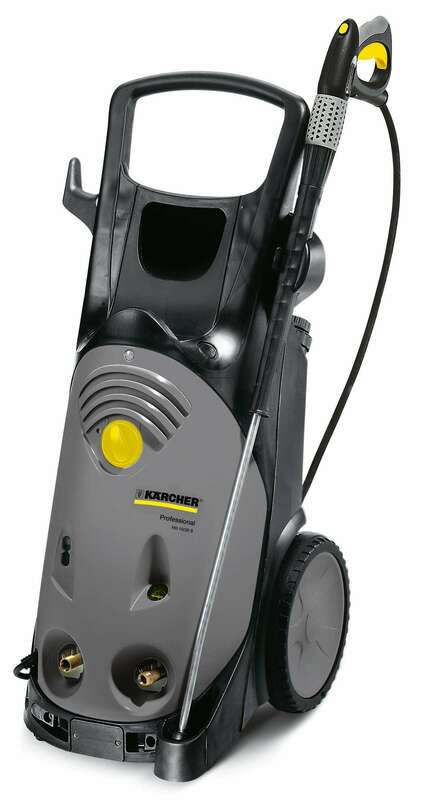 The three-phase HD 10/25 S cold water high-pressure cleaner is user friendly and offers an operating pressure of 3625 psi (250 bar) at a maximum flow rate of 16.7 L/min (1000 l/h). Thanks to its upright construction, the HD 10/25 S takes up less space than a conventional machine and is much easier to manoeuvre, especially up and down steps and stairs. Its large diameter, rubber-tyred wheels ensure maximum mobility even in difficult terrain. Accessories that are not in use can be kept safely in a separate nozzle compartment. The easy-press trigger gun offers a high degree of user comfort since it requires less effort to hold and operate and features a servopress controller for convenient adjustment of pressure and water flow rate. The spray lance can be pivoted through 360° while operating at full pressure. Other features are the pressure switch control, which turns off the pump as soon as the trigger is released and thus extends the service life of the motor and pump, and the electronic monitoring system for the motor and pump unit. The built-in detergent tank has a capacity of 6 litres. The HD 10/25 has been designed for tough daily operating conditions. The chemical-resistant brass cylinder head and stainless steel pistons with ceramic sleeves are combined with an efficient air-water cooling system to guarantee a long service life. Available with or without hose reel.